– Saina Nehwal is an Khel Ratna (highest national sporting award in India) winning badminton player. – Saina is the first Indian woman to reach the singles quarterfinals at the Olympics and the first Indian to win the World Junior Badminton Championships. 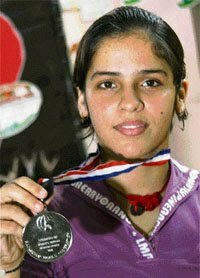 – Saina Nehwal made history on June 21, 2009, becoming the first Indian to win a Super Series tournament, by clinching the Indonesia Open with a stunning victory over higher-ranked Chinese Wang Lin in Jakarta. (The Super Series tournament is roughly equivalent to a Grand Slam in tennis). – Saina Nehwal won 2010 Commonwealth games gold in Womens Singles Shuttle badminton . – Saina Nehwal was rewarded with Arjuna award in August, 2009. – Saina has been awarded with Padma Shri award in January 2010. Saina is brand ambassador of Deccan Chargers, an Indian Premier League team owned by Deccan chronicle. 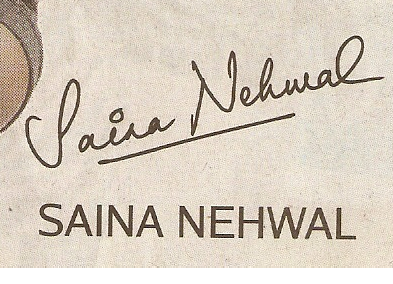 This Signature Sample of Saina Nehwal was featured in an Advertisement in Bangalore Times. 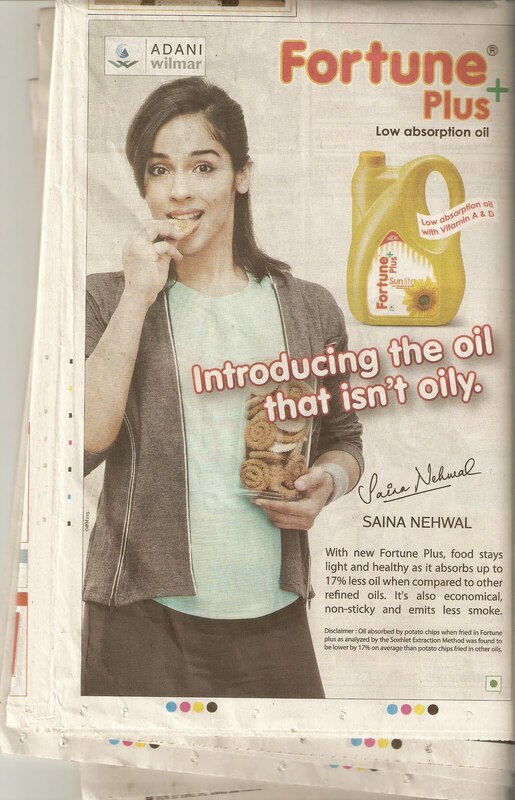 This was the Advertisement of Fortune Plus Oil. This Advertisement came days after it was announced that her brand value has reached Rs. 1 Crore . Saina is Optimistic and Positive thinking by nature. The positive thinking attitude helps him believe that tomorrow will be better day and look at the brighter side of life. Saina has the Desire to be different . She feels that she is stand out from the crowd and this difference is quite important to her. This trait is usually in teenagers when they try and be different from others by their various mannerisms, clothing etc. But i case of Saina, the reason for this difference is evident to the world. It is because of her skill at sport she loves more than anything- Badminton. Her discipline and hardwork are the key ingredients that sets her apart from any other 20 something in the country. Saina possesses Leadership qualities and Healthy Self confidence. Healthy Self confidence is vital to one’s success. It is more reaffirmation of the self. She has a Strong leadership qualities, and relies on herself. She has a great amount of Inner Strength , which goes a long way in making her a Champion that she is. It is her Inner Strength that has helped her win from tough situations. Her more recent victory in Commonwealth Games 2010, when she won from being a set down, saving a few match points went on to win the Gold. This gold eventually took India to #2 in the medal tally. This was a tremendous show of Inner mental strength. Saina is Honest and blunt in giving her Opinions. It was her honesty that landed her in controversy for the remarks over India’s Commonwealth Games preparations. She later did backed off from these comments under immense media scrutiny. Saina possess Healthy Ego and has a good sense of self. Her sense of self if not inflated and she comes across as a balanced personality. Saina has a bit of Cautiousness in her personality. She is rather careful now in order to minimize risks. Such a behavior renders her less impulsive and she usually look before she chooses to leap. She was quick to apologize as soon as she realized her comment about Commonwealth Games would be taken out of context. This incident probably makes her even more cautious. This signature sample featured in an advertisement after the games. Saina has the Acquisitiveness trait in her personality. She possess the need to acquire material things in life. Read in Times of India- Saina wants an Audi as Asian Games gift . This news item proves acquisitiveness for material things to some extent. 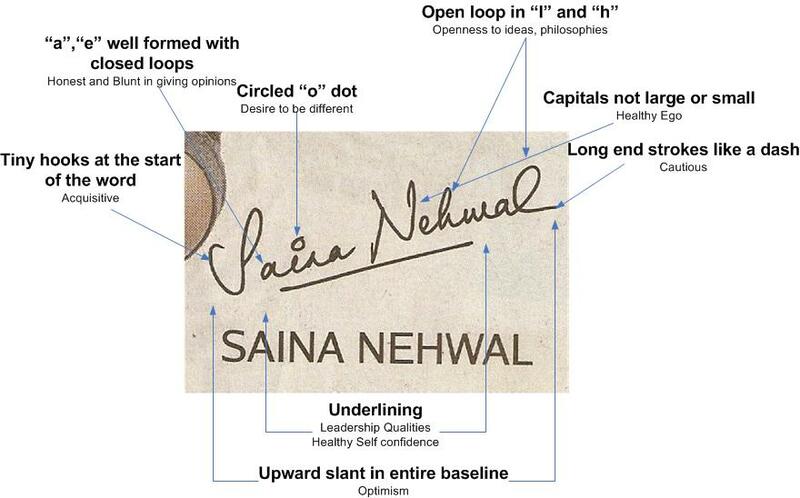 Saina is Open to other’s ideas and philosphies . Before accepting the ideas, she always tend to question if a certain idea is best for her and in what way. She picks up ideas only after she is convinced that it will work positively for her. She is a Head over Heart person and is not impulsive in her behavior. >Thanks for your kind words, Ashish.Can you please help elaborate what do you mean by "how should i keep my writings and signature to be very prominent." ? Little bit of more description will certainly help.Also, do share your handwriting and signature sample once you have clarified the same ? >Hi there! Lovely blog you have here, I'm happy I ran into you!. Nice inspiration! Thanks for sharing! « >What does M.F. Husain’s Handwriting say about his Personality ?